from solar flares or Gamma Ray Bursts (GRB). Welcome to SID-GRB@home! This web page records my attempts to build a simple VLF receiver that can detect Sudden Ionospheric Disturbances (SID) and that are caused by x-rays from the sun (solar flares) and by x-rays from Gamma Ray Bursts (GRB) from the edges of the universe. See for latest page updates. May 9, 2005: GRB050509b: Creation of Black Hole Detected. First time an optical counterpart to a very short-duration gamma-ray burst has ever been detected. February 18, 2005: The Brightest Blast Sky and Telescope article on Magnetar SGR 1806-20. Rodney Howe's article on detection of SGR1806-20 in the Open European Journal on Variable Stars. Also SlashDot and BBC articles. December 27, 2004: GRB041227 Burst from Magnetar SGR 1806-20 was detected by several SID receivers. November 20, 2004: Swift GRB Detection Satellite launched. New SID Receiver Design by Stanford Solar Center. Latest GRB Detections by Swift satellite. SpaceWeather.Com Forecast Science news and information about the Sun-Earth environment. Brownsboro, KY: Moore Observatory Solar Flare Monitor online amateur SID receiver in Kentucky observing the strong 24 KHz signal from NAA in Cutler, Maine, and a weaker 21.4 KHz signal from NPM in Lualualei, HI. NOAA: Solar Event Report archive. Today's and yesterday's report. AAVSO: GRB Alerts latest alert and archive of past alerts. HETE satellite: Event Trigger Summaries - note GRBs with XRB (x-ray burst) in the comments field. GOES: real-time X-Ray flux (5 min - last 3 days) measured by geosynchronous satellites. GOES: real-time planetary Kp Index (5 min - last 3 days) Kp-indices of 5 or greater indicate storm-level geomagnetic activity. SolarSoft latest solar event images. AAVSO-SID-LIST email list for SID-GRB receiver discussion, with searchable archives. NOAA Space Environment Center (SEC), with Space Weather Now and Register for SEC Space Weather Alerts. Google News Search for gamma-ray burst. Yahoo News Search of Reuters, Associated Press and other news sources for gamma-ray burst. INTEGRAL Satellite News about the Integral Burst Alert System (IBAS). AAVSO: SID overview, and SID Equipment. A Simple, Easy to Build VLF Receiver to Detect Solar Flares and Gamma Ray Bursts - From the AAVSO October 2002 Solar Bulletin. I built my first SID antenna and receiver using these directions developed by Cap Hossfield. A SIMPLE, EASY TO BUILD, SIGNAL GENERATOR for tuning the SID antenna. From the Sudden Ionospheric Disturbances Supplement to the AAVSO Solar Bulletin July, 2002. NOAA: Solar Event Reports check your data against these reported solar events during your daylight hours. AAVSO: Reducing Data and Email Format for SID Event Reports Gathered by VLF Monitoring Systems. Contact Mike Hill if you have built a SID receiver and want to contribute to SID solar flare event reports. He also hands out the SID Observer ID designations. Subscribe to the AAVSO-SID-LIST email list for SID-GRB receiver discussion, with searchable archives. AAVSO: Subscribe to GRB Alerts via email. David Saum Bailey's Crossroads, VA SID-GRB Receiver tuned to 24 kHz NAA transmitter. Bill Farmer (W3CSW) ATTIC LOOP ANTENNA. John Kielkopf at Moore Observatory near Louisville, KY.
I.A.R.A. Italian SID receiver (in Italian). Rodney Howe Fort Collins, CO.
NJAA SID Project New Jersey. Joseph A. DiVerdi Fort Collins, CO.
Peter Schnoor in Kiel, Germany. Please send your URL if you have a page about your SID-GRB receiver, so I can add it to the list. March 29, 2003: SID Detection of GRB030329 by Peter Schnoor in Kiel, Germany. 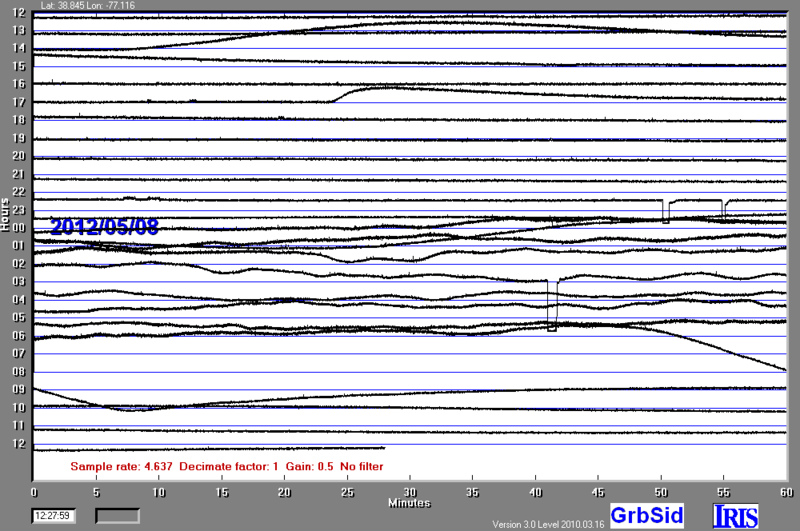 STANFORD: SID Detection of GRB by HAIL receiver on August 27, 1998. AAVSO: Possible SID Detection of GRB from the April 2002 AAVSO SID Supplement. AAVSO: Why do VLF signals strengthen at night instead of getting weaker? AAVSO: Solar Bulletin March, 2002 SID Supplement with receiver design. AAVSO: SID Database with list of observers and VLF stations. Scientific American: December 2002: The Brightest Explosions in the Universe Every time a gamma-ray burst goes off, a black hole is born. MAGNETARS, SOFT GAMMA REPEATERS & VERY STRONG MAGNETIC FIELDS Robert C. Duncan, University of Texas at Austin. Scientific American: February 2003: Magnetars Some stars are magnetized so intensely that they emit huge bursts of magnetic energy and alter the very nature of the quantum vacuum. (requires subscription to read). HETE Trigger Summaries look in "comments" for XRB (x-ray burst). HEAD High Energy Astrophysics Division of AAS - newletters with satellite status. AAVSO International Gamma Ray Burst (GRB) Network. Sign up for GRB Alerts. Book: Ionospheric Radio (IEEE Electromagnetic Waves Series, Vol. 31) by Kenneth Davies. Steve's Gamma Ray Burst Astronomy Site detailed info on how to join the amateur astronomy GRB hunt. When I built my first SID receiver antenna to Casper Hossfield's April 2002 specifications (24 turns, #14 wire, 1.5m diameter), I found that it took about 0.024 ufd to tune it to 24 khz, and not the 0.0176 ufd specified in the April 2002 SID supplement. I asked Cap about this and he said not to worry, if it works, then fine. I was using 2% capacitors and hoped to avoid some of the problems with tuning the loop, but not so. I think I have found a free program that accurately computes antenna specifications. RJELOOP3.EXE computes the parameters of receiving, multi-turn, square, loop antennas, ELF to HF. This DOS program can be downloaded here There are 5 inputs, and here are my calculations that you should double check. My antenna is 2.8 inches wide for 24 turns. or 0.1167 inches/turn or 2.963 mm/turn. I assumed here that the receiver is to be tuned to the 24 kHz Cutler, Maine transmitter. deduct stray capacitance          10   ..    .. Setting of tuning capacitor. 23579   ..    ..   ..     .. Note that the calculation of 23590 pico-farads for resonance (same as 23.59 nfd or 0.02359 ufd) is very close to what my loop required for tuning. Unless I have made some stupid math mistakes, this program should be very useful for building SID receivers. For instance, I have about 150 ft of #14 wire left from my 500 ft standard spool. Why not use all the wire and make an even more sensitive antenna? It would only be about 1 inch wider than the 24 turn design. RJELOOP3 makes it easy to compare different antenna shapes, sizes, frequencies, wire diameters, etc. VLF-LF and the Loop Aerial theory of loop aerials for receiving and how they reduce the level of local noise. RJELOOP3 freeware DOS program for analyzing receiving, multi-turn, square, loop antennas, ELF to HF (works for non-square loops with same area as square). Wire Gauge Conversion Chart wire diameters for antenna calculations. Two SID VLF system designs are in common use: 1) the Stokes design uses a tuned (narrowband) receiver and an untuned (wideband) antenna, and 2) the Hossfield design uses a tuned antenna and an untuned receiver. AAVSO: A Simple, Easy To Build, SID Receiver by Cap Hossfield, April 2002. AAVSO: A Simple, Easy To Build, Signal Generator for tuning the SID antenna. By Cap Hossfield, July, 2002. AAVSO: An Improved Gyrator Tuned VLF Receiver by Arthur Stokes, July 1999. Far Circuits sells gyrator printed circuit boards - ask for Gyrator 2, board version 04/18/01 for $7. Gyrator III VLF Receiver by Guglielmo Di Filippo. Spectrum Laboratory: free PC software that uses PC sound card to analyze VLF signals. Article on using this software as a VLF Software Receiver for SID Detection. The article includes instructions for Installing and Running Spectrum Lab. Note that typical sound cards are limited to a maximum of 22 kHz, but the new Audigy2 card can analyse signals up to 44 kHz. AktivFilter PC software for designing perfect active filters with real components. Multiple Feedback Bandpass Filter discussion and calculations. Static charge protection with neon lamps, bleeder resistors, and diode clamps. Drawing power from the PC serial port. Electronic GOTCHAS EXPOSED � Bypassing � Decoupling � Groundplane � Shielding � Layout � EMC. EDN Magazine: Design Ideas: Circuit Offers Improved Active Rectification article about a clever circuit that is a possible replacement for the SID receiver diode rectifier. Radio-Skypipe free software for using your PC sound card or ADC for displaying data and sharing it over the internet. DATAQ 194 $24.95 10 bit ADC and PC data logging and display software. Onset HOBO 8 bit data loggers for about $100 with PC display software. Dimension 4: freeware PC time synchro utility. Rustrak Recorder manual online PDF (requires Adobe Acrobat Reader plugin). Partlow West Rustrak chart recorder repairs, paper, parts. Empire Instruments Rustrak chart recorder repairs, paper, parts. Davis Instruments Rustrak chart recorders. Paper is available but it is not listed on web: part number # Ru2004A at $9.10 per roll. Ebay Search for current Rustrak auctions or search for completed Rustrak auctions. Klaus' Radio Page longwave links. INSPIRE Interactive NASA Space Physics Ionosphere Radio Experiments - a project for High School Students. Plans and kits for a VLF radio receiver (VLF-3 kits are now available - order kit). VLF link page. Listen to natural radio sounds. More earth songs. Radio Waves below 22kHz Natural Radio Signals and Strange Emissions at Very Low Frequency. Canadian Lowfer (Low Frequency Radio) Page. AARL: How the sun influences radio propagation. Stanford U: VLF Group. Research projects including HAIL Holographic Array for Ionospheric Lighting research that detected a GRB on August 27, 1998. Radio JOVE Project Build and use your own Decametric Radio Telescope. Auroral Chorus Stephen P. McGreevy's Natural VLF Radio Receiver (plans and finished units). AARL the national association for Amateur Radio. ViennaWireless The Vienna Wireless Society (Vienna, VA). NOVAC The Northern Virginia Astronomy Club. todays aurora forecast from Alaska. SpaceWeather.Comlatest news about earth-sun space weather. Aurora Alert sign up for email alert. 1. Go to the Windows control panel under "Date/Time" and set your computer to GMT with no daylight savings time. Right now (winter) this is 5 hrs earlier than Eastern Time. It is not too much trouble to work with a PC set to this time. 2. Go to AboutTime and download the free program "About Time 4.8". This Windows program finds the reference time on the web and resets your computer clock to it. It even corrects for the travel time of the web packets. Set your clock within a few ms of UT with this program. If your computer has a dedicated web connection, you can set AboutTime to reset the time ever 10 or 15 minutes, and that keeps your computer clock in synch. However if you do not have a dedicated web connection, then you want some way to adjust your internal PC clock to an accuracy of a fraction of a second per week. Go to step 3 to find out how to do this. 3. Go to RighTime and download the shareware program RITM514.Zip. This program only works for DOS of Win95-98, not Win2k. It makes changes in your autoexec bat and each time you correct your PC clock, it makes the PC clock error smaller. I have been able to get my data logger PC to within a fraction of a second per week accuracy. I have found that you must install this program in the DOS mode that you get into from the Win95-98 shutdown. It took me about a week of these corrections to get my PC time reset accurately. Rightime has a free trial period that you should use to see if it works for your computer. I have had success in 3 out of 4 PCs. So far I have not gotten it to work on my AMD Athlon 850. I found when I started my seismometer project in 2000 that most of the existing seismic data logging software was programmed to accept data from a few PC a/d boards, and most of the programs did not accept the ASCII data records that microprocessors can easily output. However I found one program that the author was willing to modify to accept simple ASCII records: the freeware program Amaseis. Here is all of the seismic software that I am have heard of that might be of use for SID-GRB data logging. Please send me links to all the software I have missed. Amaseis Alan Jones' data logging software for Windows (free). SEISAN, SEISLOG, SEISNET Institute for Solid Earth Physics software for Windows. Article describing Seislog. WinQuake Larry Cochrane's event viewing software for Windows ($35). SDR Larry Cochrane's data logging viewing software for Windows (free). EMON Ted Blank's data logging software for DOS (free). 6SMOWIN Mauro Mariotti's data logging software for Windows (free). Please if you know some other software that I should list here. I started on some Visual Basic software for data logging, but I have not had much time to work on it. Perhaps we need an open software project to develop SID-GRB software. Please if you have some interest in this type of project. Search enginz all about second hand book search, including book coupons. Bookfinder compare used book prices. BestBookBuys compare new book prices. Amazon Art of Electronics by Horowitz and Hill (THE BIBLE!). Amazon Active Filter Cookbook by Don Lancaster. Amazon Troubleshooting Analog Circuits by Bob Pease (THE GURU!). Amazon The Art and Science of Analog Circuit Design by Jim Williams. Amazon Analog Circuit Design : Art, Science and Personalities edited by Jim Williams. Amazon USB Complete: Everything You Need to Develop Custom USB Peripherals by Jan Alexson. Amazon Serial Port Complete by Jan Axelson. SimCo, OKW, SerPac, PacTec, Fibox inexpensive plastic enclosures. How to solder surface mount parts using a toaster oven. Brown Dog Component Adaptors DIP adaptors for surface mount chips. Digikey: Surfboard adaptors to go from surface mount to through-hole (pdf file of catalog page). DIY Air-pencil soldering iron how to make one for under $20. GPS boards OEM board GPS for $79. Newsgroups: sci.electronics.basics, sci.electronics.components and sci.electronics.design. Circuit Cellar magazine for embedded control applications. PicBasicPro for programming PIC microprocessors, and email list with searchable archives. CCS PIC C for programming PIC microprocessors (user exchange). DataQ DI-151RS Low Cost, 12 Bit A/D Serial Port Starter Kit As Sold By Radio Shack. Newsgroups: comp.dsp, alt.microcontrollers.8bit and comp.arch.embedded. PIC Tutorial: Understanding & Programming the PIC16C84 A beginners' tutorial. PICLIST email list for people interested in the Microchip PIC. Amaseis freeware seismic data acquisition program. Instructions for using Amaseis to analyze seismic data. WinQuake seismic event viewing software. Instructions for using WinQuake to analyze seismic data. Spectrogram 5.1 freeware audio spectrum analysis software. FilterLab freeware tool that simplifies active filter design. RighTime corrects the drift in your inaccurate PC clock. AboutTime freeware uses the internet to precisely reset your PC clock. TaskInfo shareware that monitors the resources used by PC programs. CADSOFT: Eagle PCB Circuit Design Package. Electronic Assembly News list of pcb sources. AP Circuits quickturn prototype pcb's for under $100. EP Circuits quickturn prototype pcb's can include solder mask. Advanced Circuits good prices on production runs of pcb's. Futurlec great prices if your boards are in Protel format. Pulsar great prices on production runs of pcb's. NeatSite links related to PCBs. Making Printed Circuit Boards book by Jan Alexson. How to Make PCBs This is how I make them. X PRIZE 10 million dollars for the first private space ship. Scaled Composites builder of SpaceShipOne, an X PRIZE competitor. Build a Radio Telescope for $300. SoPrePlaTec (pronounced "soapy platex") The Society for the Prevention of Plate Tectonics. Sensors an awesome link page! Vernier Science Hardware and Software for the Classroom. Tinkers Guild Resources for Hands-on Science - sells CD of projects from the Scientifc American Amateur Scientist column. Society for Amateur Scientists online projects and supplies. Detecting Extraterrestrial Gravity by Shawn Carlson, from the January 2000 Scientific American Amateur Scientist Column. Detecting Micron-Size Movements by Shawn Carlson, from the August 1996 Scientific American Amateur Scientist Column. Earth Songs If humans had radio antennas instead of ears, we would hear a remarkable symphony of strange noises coming from our own planet. Crackpot Inventor original electronic devices, tools for clockmaking and repair, and a variety of other unusual handmade products. Mad Scientist Network the laboratory that never sleeps. Infrasound Monitoring with a Microbarograph directions for building a system. How to detect low frequency acoustic waves in the atmosphere. NOAA: Infrasonic and Near Infrasonic Atmospheric Sounding and Imaging by Bedard. NOAA: Infrasonics Program new sensor/filter design; detection of avalanches, tornadoes, earthquakes; etc. Infrasound Expert Group 1995 report. PROTOTYPE INFRASOUND SYSTEM Near Real Time, Automated, Unattended. BBC News: Low sounds detect meteor blast 3 September, 2001. BBC News: Science in search of the low rumble 9 October, 2002. SETI@Home join the search for extraterrestrial intelligence. Click here for my latest statistics. My Seismograph page how to build a seismograph. My Business Page Infiltec Air Leakage Control. My fun page jokes and travel photos. My Gold Prospecting Near Washington, DC Page. Please any suggestions or corrections to my SID-GRB related links. hits since April 3, 2010. This page was created by , and last updated on October 25, 2011.